Once in awhile, a story comes along that warms your heart and restores your faith in humanity. And after reading and writing so much about morally ambiguous things or scary developments, this is one that I was happy to share! 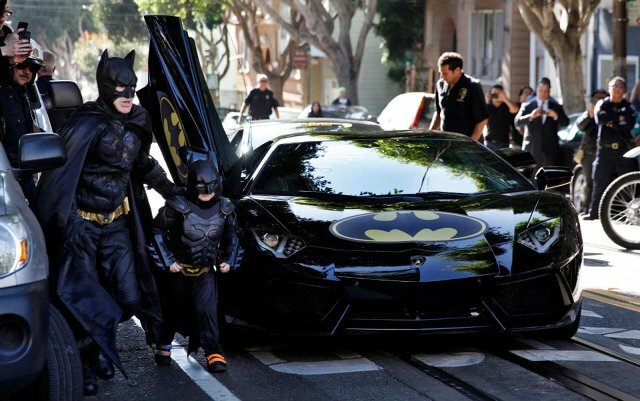 This past November, in what was an online media circus, 25,000 people showed up to watch a five year-old boy cruise around San Fransisco in a Batman costume and a Lamborghini with the logo on the hood. 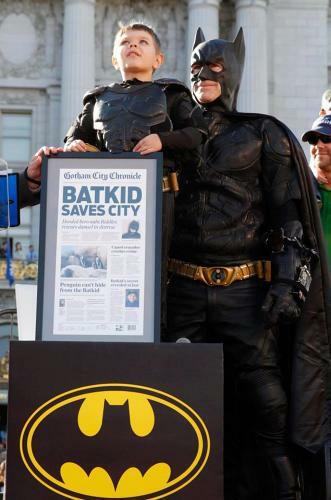 After doing battle with his enemies – which included the Riddler and the Penguin – “Batkid” was taken to City Hall where he received the key to the city from the mayor. The city spent $105,000 on the event – covering things like speakers, a big screen at city hall, and cleanup crews – and everyone from Barack Obama to Britney Spears expressed their heartwarming support for the costume-clad Batkid. This massive effort, which was a viral media sensation, was orchestrated by the Make-A-Wish Foundation for Miles Scott, a five-year who has spent half his life struggling with leukemia. Having finished his course of chemotherapy, it was Scott’s dream to be Batman for a day. And now, a documentary called Batkid Begins, is retelling the story of Batkid, the Scott family, and how one kid’s wish went viral. I was looking for my next film to be uplifting. 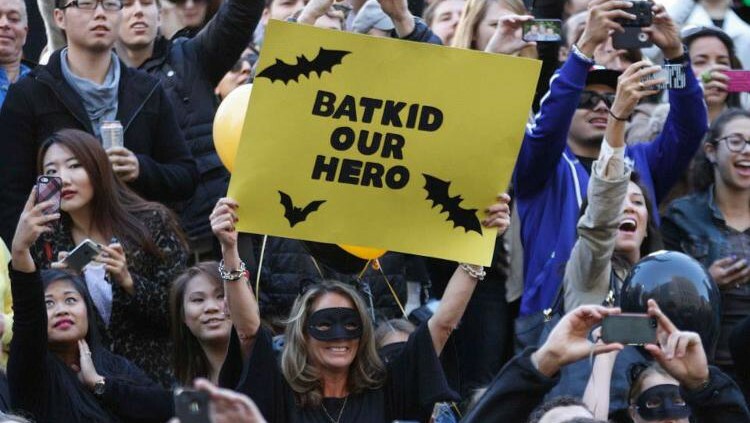 I didn’t even know about Batkid until after it happened, and I blown away that I had missed it, and was just so touched by the outpouring of support for this child. Through a friend at NBC, where she formerly worked, Nachman was able to get a meeting with Make-a-Wish, which had already been approached by others wanting to do Batkid documentaries. Though Scott’s family had been reticent to do much press surrounding the Batkid event, they offered to work with Nachman on the film. After making their son’s wish come true, the Scott family hopes to raise awareness about the Foundation and the work it does. The three-act story will start with a focus on Scott and his experiences, segueing into the lead-up to the event itself as it went viral and everyone scrambled to keep up with the momentum. The third act will focus on the event itself, which involved Miles rescuing a damsel in distress from the train tracks, stopping the Penguin from kidnapping the San Francisco Giants seal mascot, and getting the key to the city from the mayor. To me what’s interesting is that everyone approached for the [Batkid event] said, ‘Yes, I’ll participate and I’ll make it even cooler by doing this, this, and this.’ That’s the message of the film to me: ‘Yes, and.’ If I had my dream, that would be the title of it, but I think it’s a little too esoteric. The $100,000 in funding that Nachman hopes to collect on Indiegogo will help out with animations, a soundtrack, and other production assets. A rough cut will be ready by the one-year anniversary of the Batkid event (this coming November), and the film will likely premiere early next year.I don’t know about you, but… a young boy who had a brush with death getting to live out his dream of being a superhero? I’m certainly going to see it! You got Miles Scott! I’d see that movie. It sounds incredible. And it’s really a story of hope and always fighting even when things are bad. We could use more of those stories. By the way, if you could wish for something awesome like that, what would you wish for? Wow… now that is the big question, isn’t it? I think I’d want to go into space. Either on a rocket, or as part of the aerospace ride with Virgin Galactic. Either that, or handle some serious military hardware, like an exoskeleton. You? I’d probably want a Friday the 13th themed flash mob. I have it all planned out in my head. I just need the time and people and costumes to make it work.